Ever thought an explosion could save your life? It’s true when it comes to how airbags work. If ever you experience the unfortunate event of a car accident, a controlled explosion will deploy your vehicle’s airbag to cushion the blow from the collision. Though airbags have caused minor injuries to drivers, they have saved the lives of many people by reducing the damage to the body at impact. Here are some little-known facts about the airbag and how they can help you in the event of an accident. John W. Hetrick, an engineer for the US Navy, held the original patent for the airbag in 1957. This invention was merely a bladder filled with air but its fault was that it was too slow upon deployment. In 1964, Japanese inventor Tasuzaburou Kobori invented the first explosive airbag. Still improving, in 1976 Allen Breed developed airbag sensors to detect the impact of an accident. These sensors were used in the vehicle and airbags deployed in 30 milliseconds, much faster than the original air-filled bladder. By the 1970s airbags were used commercially and in the 1980’s they were slowly introduced into vehicles. By the 1990s, most vehicles in the US were equipped with airbags as a standard feature. The airbags in a vehicle are set to deploy when the vehicle is hit from the front bumper, rear bumpers, and/or side doors. Sensors are placed in each of these areas of the vehicle to detect a significant impact by sending a message to the car’s internal computer. 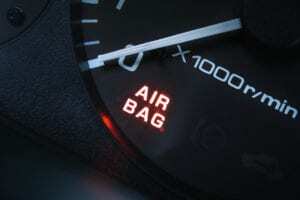 Nowadays, vehicles are equipped with several airbags in order to protect all passengers. The driver’s airbag is located in the steering wheel, front passenger airbags are located in the front dash area, and side curtain airbags are located in the door pillar where the seat belt is suspended. Problem with the seat belt system – Something may be interfering with the seat belt sensor. This is the sensor that detects if the seat belt is properly fastened. Check to ensure nothing like dust, debris, or even loose change has fallen into the buckle that could cause the sensor to trigger the airbag light. Damaged Clockspring – Located between the steering wheel and steering column, this spiral-wound electrical sensor allows the steering wheel to turn while making an electrical connection between the steering wheel, airbag, horn, and other devices in the electrical system. Minor Accident – If your vehicle was involved in a minor collision that did not warrant deployment of the airbag but still triggered the car’s crash sensors, the light may come on indicating it needs to be reset. The process of airbag deployment may produce smoke from the chemical reaction or powder used to prevent the airbag from sticking together or rumpling. Many riders have been injured by the airbag with burns, cuts, bruises, and even broken bones. Still, having a vehicle equipped with airbags has been proven to be safer than those without. You can help increase the effectiveness of your airbag’s protection by making sure children ride in the backseat, always keep seatbelts fastened, and adjust seats to a safe position. While airbags can be a life-saving measure for grown adults, the same cannot be said for children under the age of 13 or that weigh less than 65 pounds. The safest place for a child in a car is in the center of the backseat, with a seat belt buckled. Children under four feet nine inches should be properly restrained in a booster or car seats. Because airbags inflate so quickly (less than 1/20th of a second) and propel up to 200 MPH, the force is enough to cause severe head injuries and even fatalities in children. Airbags help to increase the cushion of an impact felt from a crash, however, drivers and passengers should still be seated properly, facing forward with backs against the seat. Additionally, in order for airbags to be effective as opposed to harmful, all vehicle occupants must wear their seatbelts correctly and at all times. Safety experts also recommend that passengers avoid sitting too close to the area where airbags are deployed. Drivers should move their seat back as far as possible to increase the distance from the airbag and keep hands at the “10 and 2” positions on the steering wheel.